Every now and then, we’re lucky enough to experience something that makes us feel like everything we do here at The Lifestream is worthwhile. This past weekend in London did exactly that as about a dozen of us attended the second KupoCon fan event, Mind the Pom. While we’ve always been proud of our community, it felt truly exceptional to be able to connect with the wider network of Final Fantasy fans in such a big way at Mind the Pom. We had the time of our lives and we’d like to thank a few people for making it so memorable for us. The organisers and volunteers for all your hard work – you made it run very smoothly. Special thanks to Community Manager Alan Kenny, who has been a member of The Lifestream for three years now under the name RedFFWolf and without whom many of us would not have been able to attend, and to Lead Organizer Alex Maine, not only for putting the events together but also for allowing The Lifestream to be affiliated with them. Expect to see more of us at future KupoCons! All the cosplayers – you made the event look incredible! Particular shout-outs to the Final Fantasy VII cosplayers we saw (we’re biased, what can you expect), including Cloud, Miss Cloud, Tifa, Aeris, Cid, Vincent, numerous Turks, and perhaps most impressively, Red XIII in a Shinra uniform. It’s difficult to stand on both feet, isn’t it? And last but not least, all the people we spoke to and the friends we made! We’d love it if you stayed in touch – we’ve got an enormous Mind the Pom thread on our forum full of stories, photos and in-jokes, but you’ll need to be a member to read or reply to it. If you think we won’t remember you, you’ll probably be surprised! We also have a Tri-Pom card trading post, which is open to everyone, so if you’re missing any cards or have some duplicates, why not sign up and trade them with us? 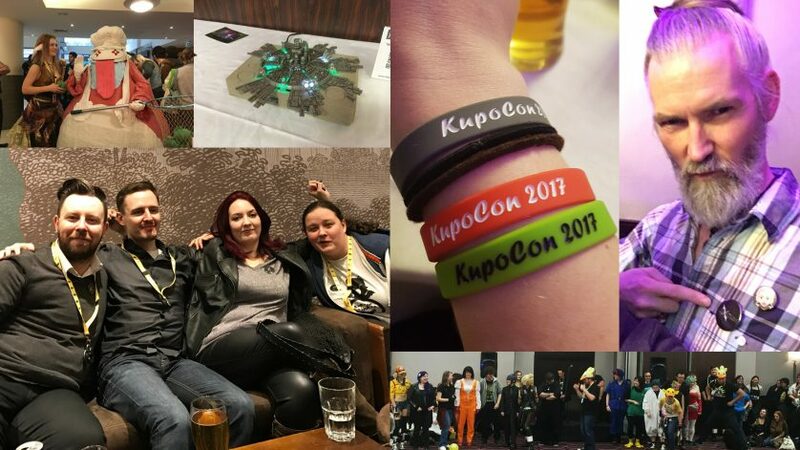 If you’re unsure about going to a KupoCon event, we wholeheartedly recommend you give it a try – you won’t regret it! The next one, Pomtario, is taking place in Ontario this December – tickets go on sale on the 10th of April – and a second UK event has been announced for 2018. We’ll be there to defend our hard-earned quiz title and we hope you will be too! Until then, thanks again from everyone at The Lifestream! With thanks to Shademp for providing the final image background. All the photos used in this article were taken by members of The Lifestream. You can find higher quality pictures on the KupoCon Facebook page.